Woo! 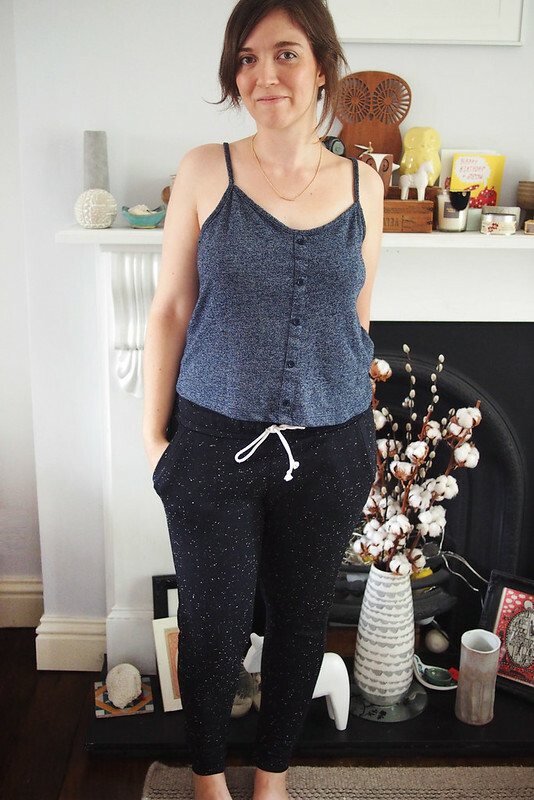 I’m so pleased for Kelli of True Bias: her first pattern, the Hudson Pants, is now available, and it’s a cracker. 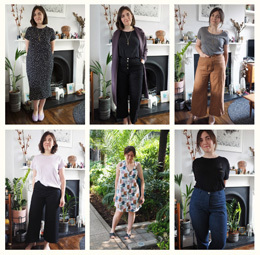 I was fortunate to be asked to test for this pattern so I’ve already had time to sew up two pairs – you might have seen my first pair on Instagram right at the tail-end of Me-Made May. Trust me, if you get hold of the pattern you’ll be making multiple pairs of these babies too. 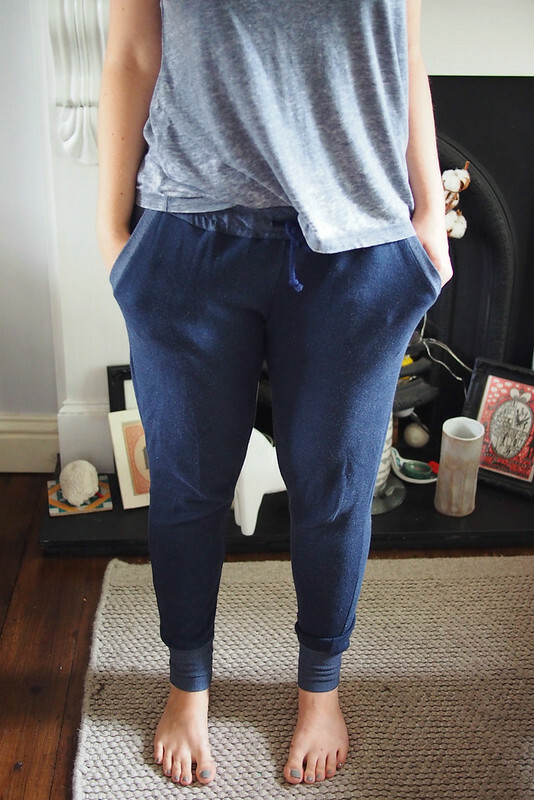 The Hudsons are a snug-fitting, low waisted urban jogger, with trimmed yoke pockets, a topstitched wide elastic waistband finished with drawcord, and deep ankle/calf cuffs. 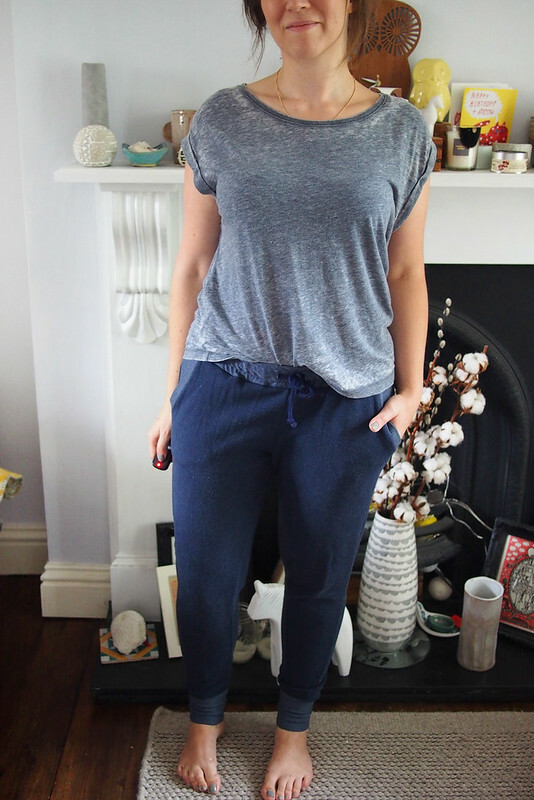 Perfect for work at home or out and about errand kind of days – of which I have a lot. My first pair is made from a double-sided ponte knit bought locally. I used the navy side for the main trouser, with some contrast at the hip and cuff using the lighter reverse side (Hudson is MADE for fun colour blocking). I think that ponte is a perfect choice for the Hudson, as the medium amount of two-way stretch makes them super comfortable but not bag out too much. Sewing these up is really fun and from cutting to sewing you could definitely make a pair in one session. What makes them intermediate rather than beginner is having to set the cuffs in the round, and the rows of topstitching on the waistband, where keeping the elastic uniformly gathered is key (I didn’t quite nail it on this pair, and there’s a bit of puckering). 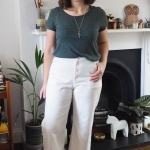 The instructions are excellent and well diagrammed so a confident beginner could easily tackle them, and they’d make a great introduction to the wonderful world of sewing pants. Sizing wise, my waist measured about 3 sizes smaller than my hips on the chart, but Kelli recommends you go with your hip measurement as the waistband is elasticated anyway. The fit came out pretty good, just a bit tight across the bum so I might size up if I wanted a looser fit. The only thing I noted as a tester is that the ankle cuffs were a bit tight too, but Kelli has adjusted this in the final pattern to add a tiny bit more ease. I can’t imagine the shape would not work on anyone to be honest. I loved my first pair so much I made another a week later. My second pair is in a heavy terry-backed flecked jersey from Minerva. I cut exactly the same size as before but you can see a slight difference in fit: this knit has less widthwise stretch and hardly any lengthwise stretch. The result is a snugger, almost legging-type fit down the leg and a lower rise. I’m totally ok with this because I think it makes the pants a bit smarter; I could definitely wear them with a nice tee and loafers for work, whereas the first pair are a bit too casual for that. 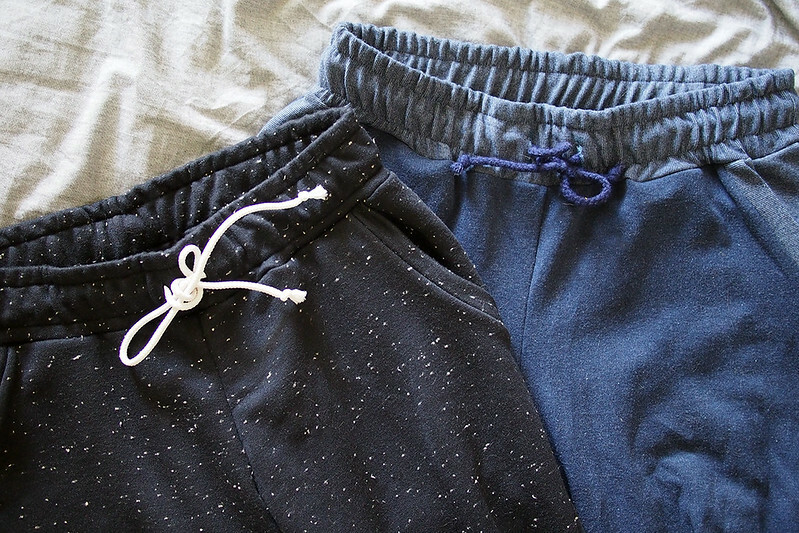 I’m already imagining more pairs – I want some calf-length ones for the warmer weather (perhaps even shorts length too) and also want to try them in a lighter weight patterned knit, which I think could create a loose drawstring pant kind of effect. 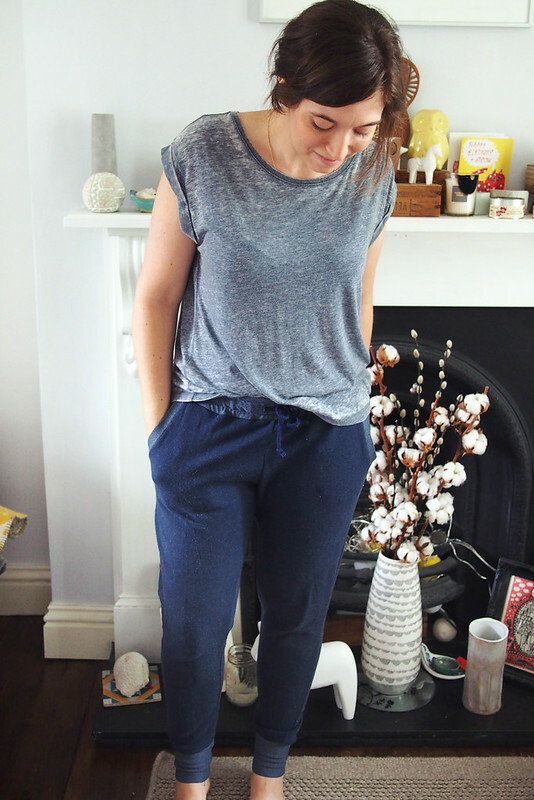 I think it’s a pattern which really fills a gap for comfortable yet not completely slobby leisurewear, and I’m sure I’ll come back to it over and over. 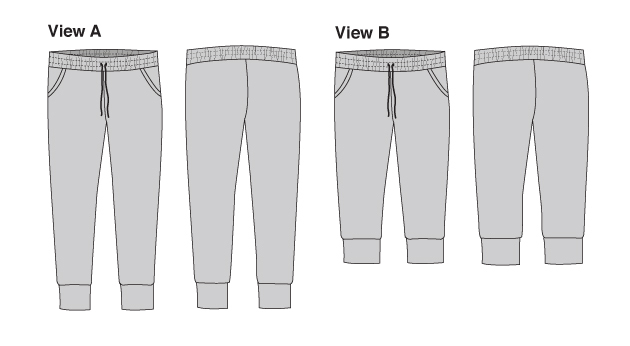 You can buy the PDF download Hudson pant pattern for $10 right here. I received a free copy of the draft and final pattern as a tester; views are my own. I really love the fabric on the second fair! Can’t wait to try this pattern out after a bit more practice….. These are brilliant! I really want to make a terry pair. Love your flecked version! The minerva terry is ace, maybe just size up one as it doesn’t stretch much. Ooooh, cute! I definitely want to make these now. Maybe they’ll be my first ever trouser make! These are very stylish stretchy wear! I’ve been tempted by this shape for a while, but I’m still not certain without trying a similar RTW style on first I think! 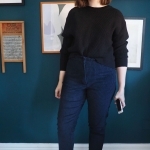 They look great on you – you are queen of the trouser! To be honest these aren’t the most flattering style on my rear, but they are comfy lounge pants so I can deal! These are super cute! Love the fabric from Minerva. How’s the width around the thigh? I have rather athletic (um big) thighs and always struggle to find pants that fit without making my legs look hulking. I’m ‘sturdy of thigh’ as well and you can see how they fit on me. If you go by hip measurement you will be fine and you can just cut the elastic smaller at the waist if needed. Great fabric choices!! I’m excited about sewing up a couple of pairs of these once the cooler weather comes back around. 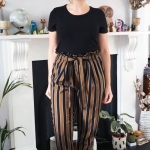 I’ve been trying to find this EXACT type of pant in RTW, and in my budget, for the past few years but with no luck. Thanks for your thoughts on the pattern and fabric choices! Very helpful! Love your versions so much and I am obsessed with that black spec fabric. Thank you so much for this review and for being such an amazing pattern tester! These look super-comfy and stylish too. 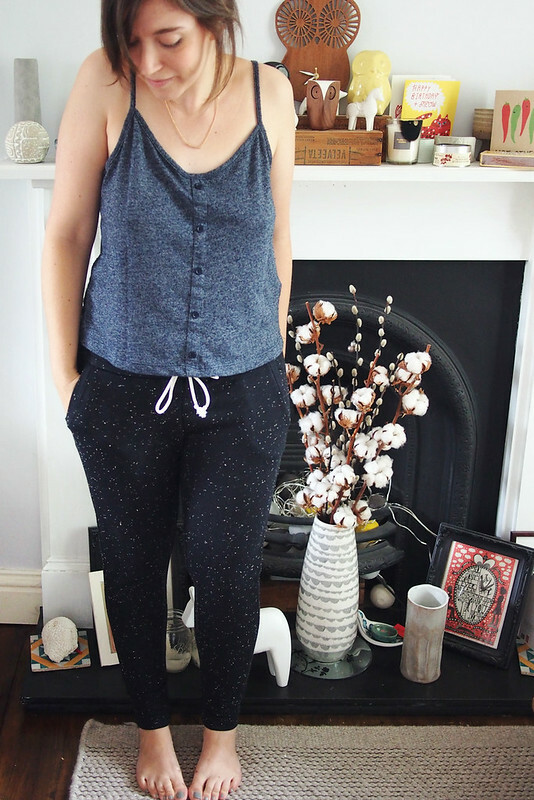 A great pair of joggers Katie. Great colourways and fabric choices too. these are so cute! i can’t wait to make my own, i know i’d live in them! These look fantastic, especially the second pair!